JR Sanders' love for nature was instilled during his childhood as he explored the majestic red mesas of Continental Divide, New Mexico. His early artwork during high school consisted of pencil drawings. Sanders expanded his skills as a student of art at Fort Lewis College, in Durango, Colorado. He graduated with a BA in Fine art. After eight years in the work field, Sanders made the decision to follow his true passion, by enrolling into the Academy of Art University of San Francisco to pursue a Masters in Fine Art. There he learned the basis for oil media while creating works in still life, landscapes, portrait, and figure paintings. Returning to his love for nature, combined now with his love for art, lead him to becoming a plein air artist. Sanders has studied with contemporary masters of landscape artists, such as Skip Whitecomb, Matt Smith, Dan Young, Jill Carver, and Joshua Been. JR Sanders lives in Smithlake, New Mexico. 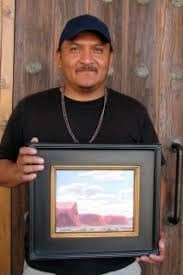 He will often be found painting the landscapes of Northern New Mexico, The Land of Enchantment, as well as the sandstone cliffs and bluffs of Arizona. Sanders plans to extend his plein air paintings to include the monoliths of Moab, Utah, The Gateway to the Rocky Mountains of Estes Park, Colorado, and the immense splendor of the Grand Canyon and Canyon de Chelly, Arizona.